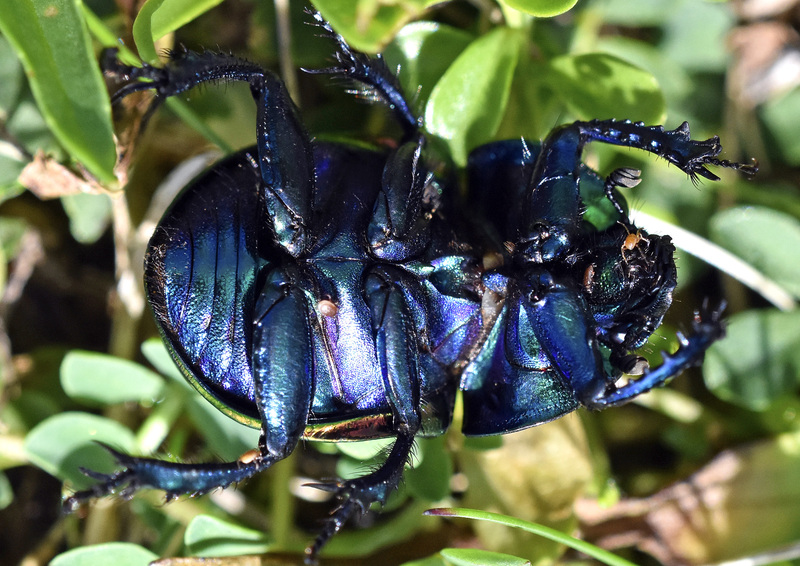 Flip over one of these beautiful dung beetles – which are found in northern Spain – and more often than not you will see a bunch of tiny mites – hangers-on! – on the shiny blue underside. These hitch-hikers are called phoretic mites. Phoresy, or phoresis, is the transport of one animal via another; but for mites such as these it is probably best described as a form of assisted migration (Binns, 1982), as they use the carrier beetles to take them on to fresh dung pats where the feed on fly larvae and nematodes (Niogret et al, 2006). 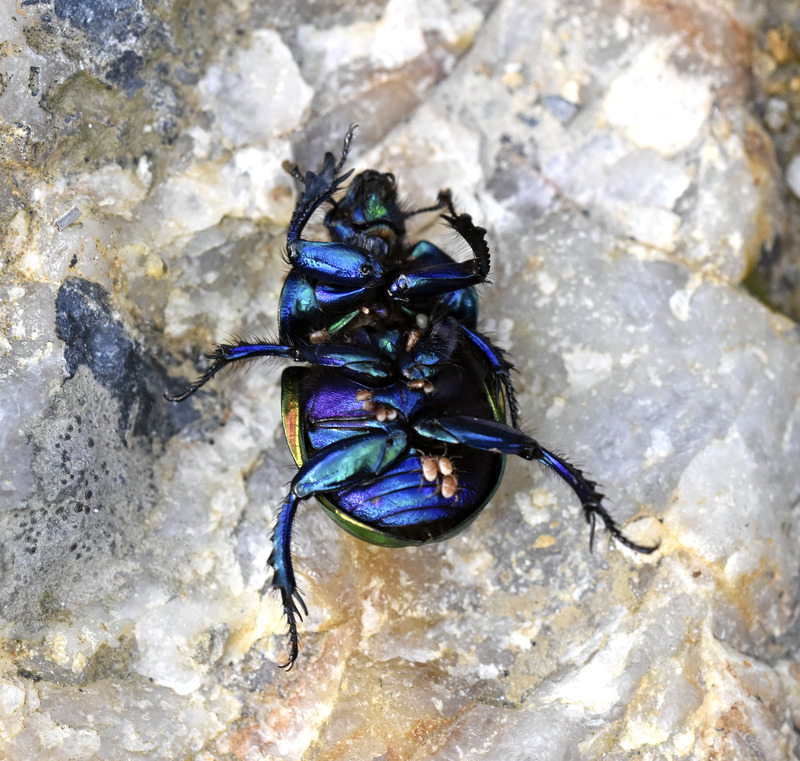 One might think that they are rather taking advantage of the beetle for a free ride, but they repay this debt by feeding on flies, which compete with the coprophilous beetles over the dung. So on the face of it, it looks like a mutually beneficial arrangement, although depending on the species involved, phoresy probably spans the whole spectrum from symbiosis to parasitism (Perotti et al., 2009). 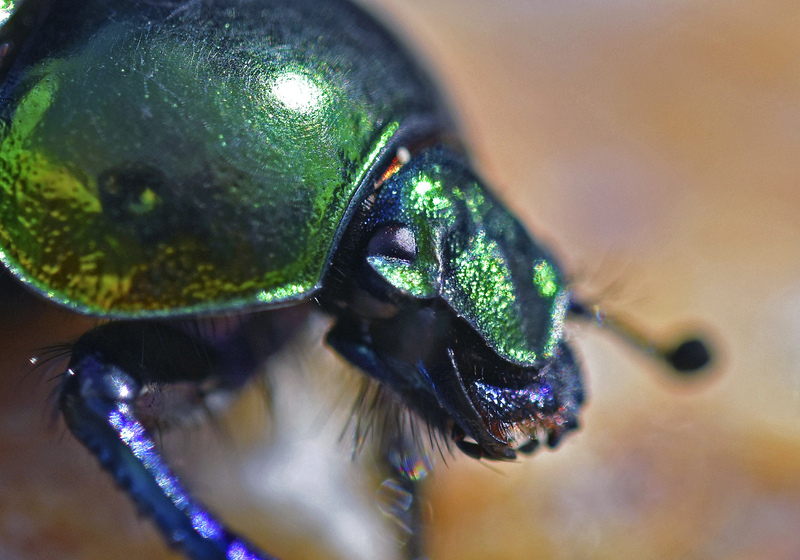 Dung beetle (Trypocopris [=Geotrupes] pyrenaeus var. coruscans) dorsal view. It is not possible to say with certainty from a photograph what species of mite these are; one would have to collect them and examine them under a microscope. But it is interesting to speculate what they might (sic) be, on the basis of what phoretic species have been found on Trypocopris pyrenaeus beetles. For example, Macrocheles glaber mites have been found on T. pyrenaeus in France and they were one of the most common phoretic species collected on a total of 27 carrier species, including 25 beetles (Niogret et al., 2006). M. glaber is a generalist mesostigmatid mite (Acari: Metostigmata) with a cosmopolitan distribution. Found in dung, manure or soil, Macrochelidae prey on the eggs and larvae of flies and nematodes in dung pats and have been investigated as potential biological control agents. 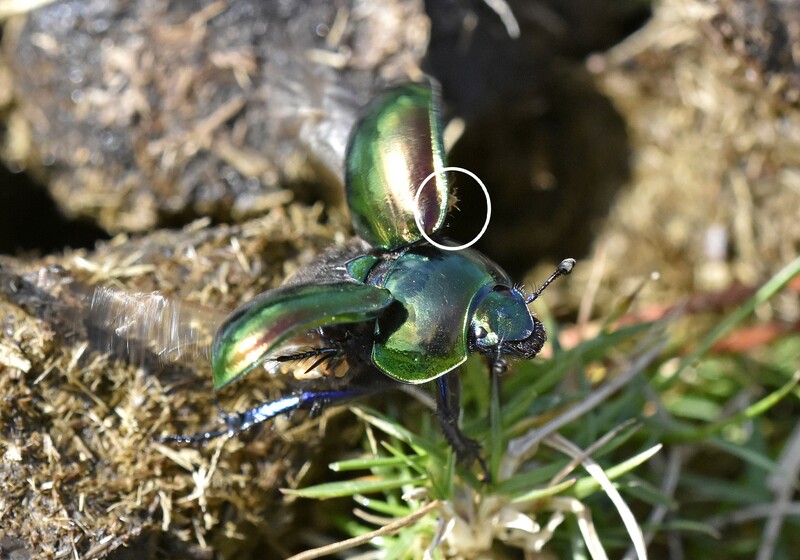 Macrochelid females are phoretic on dung beetles and/or coprophagous flies, and reply on these carriers to take them from deteriorating dung pads to more suitable ones. 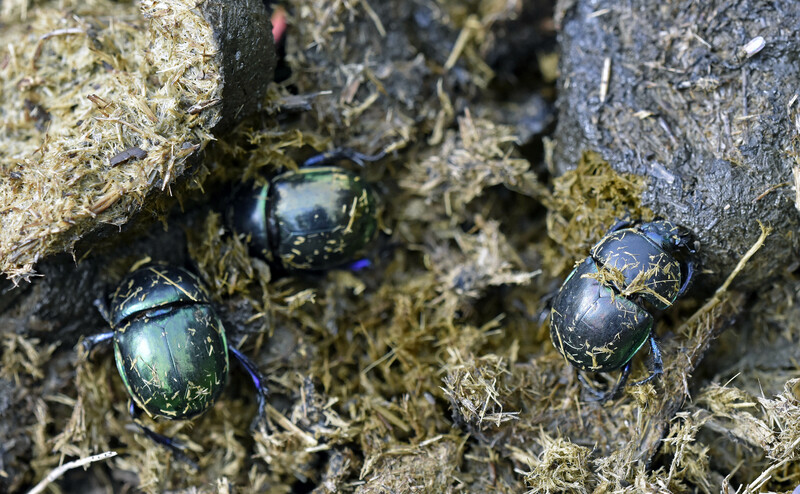 The dung beetles themselves, will also be colonising fresh dung as it becomes available. In this upland habitat in Galicia, NW Spain, where the photographs were taken, the beetles were found mainly on horse dung. 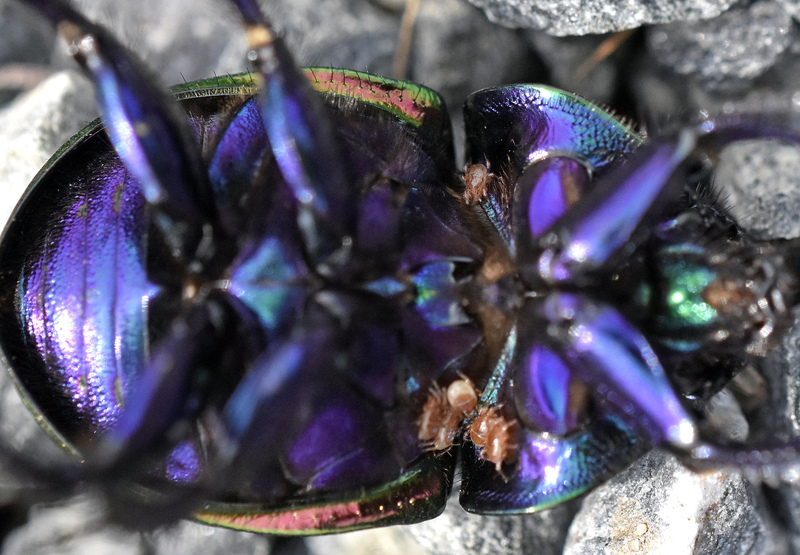 The mites appear to crawl all over the beetles although they do seem to accumulate in favoured spots, such as where the thorax joins the abdomen. I am not sure how quickly they move about on the carrier beetle, but I get the impression that they are quite mobile and presumably can hang on to anywhere that there are hairs growing. 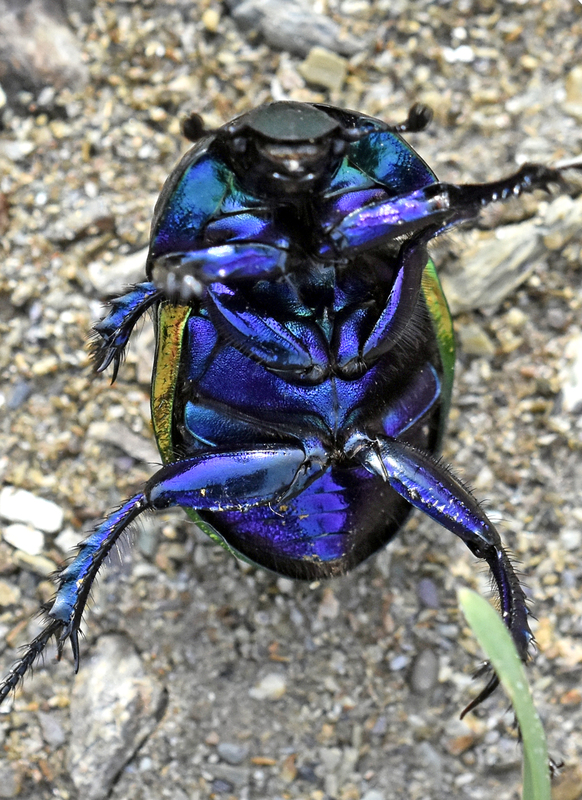 The smooth parts on the upper (dorsal) surface of the beetle must be a bit like a skating rink for these mites, which is why they do not appear there. 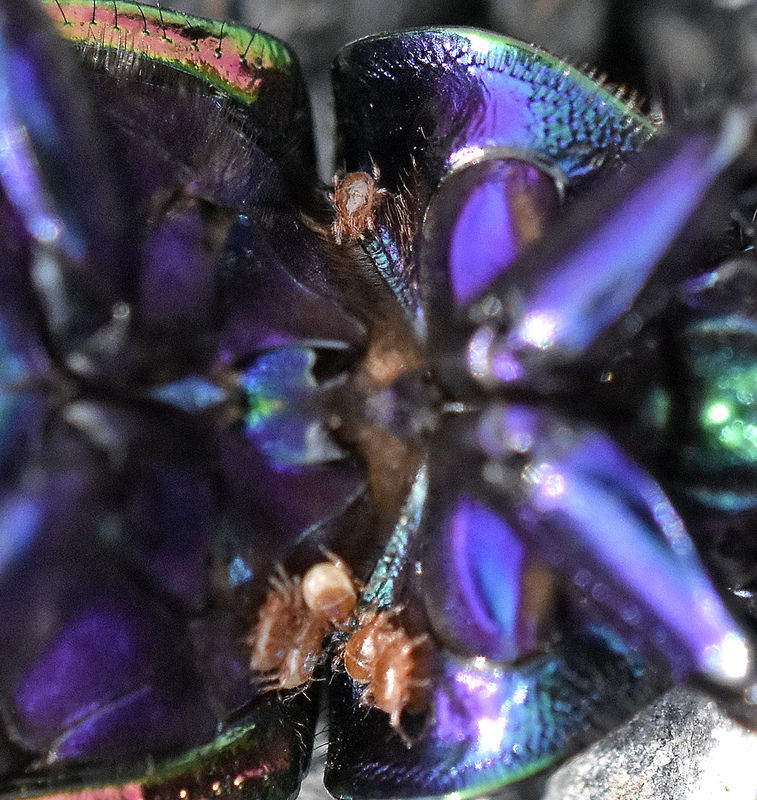 There was even one mite hanging on to the inside of the elytra as the beetle took off (see below, circled). They must be very good at hanging on – using their mouth-parts (chelicerae) – especially as these beetles fly at quite a speed! 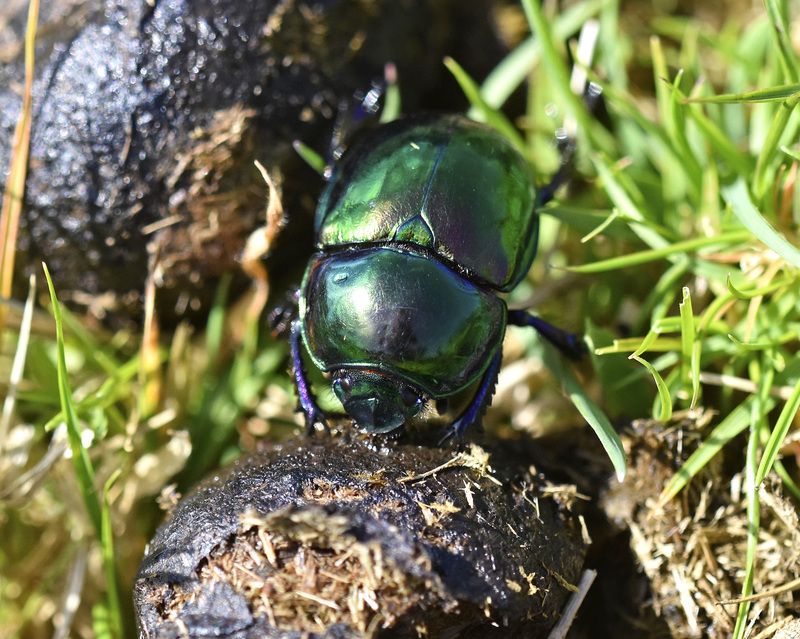 The beetles are often seen wizzing through the trees, looking like tiny green helicopters, presumably following the sent of freshly deposited dung; or are there pheromones emitted by the first one to colonise a dung pat? So much to find out about this species. Some phoretic species are extremely good at hopping on and off their carriers, for example during feeding stops (Perotti et al., 2009). 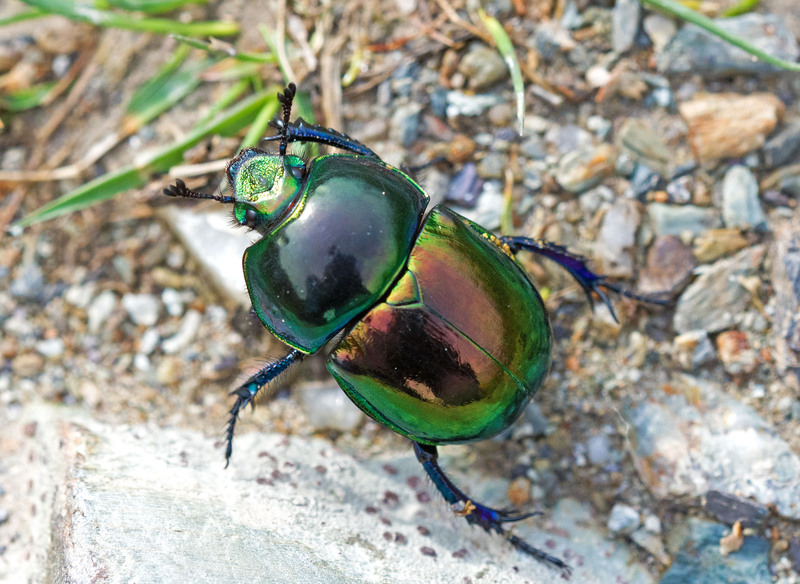 How they know when a beetle is about to take off – and potentially leave them stranded – is anyone’s guess! Some beetles I examined did not appear to have any phoretic mites on them (see below), but this was far from being a thorough study. 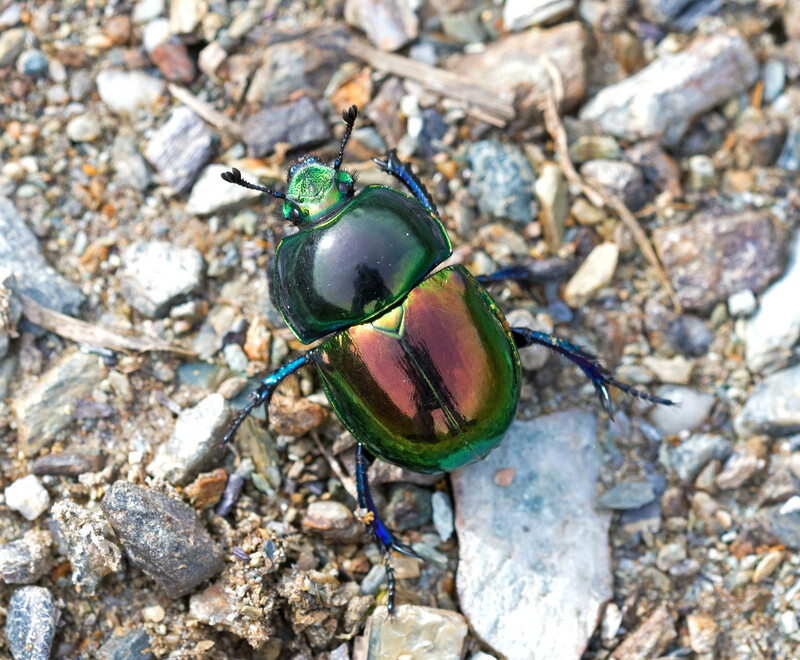 These beetles are very numerous in montane areas of northern Spain and – as mentioned before – would make an excellent insect to study in terms of its ecology, commensals, iridescent colouration and so on. Another mesostigmatid, phoretic mite species which has been found on T. pyrenaeus in the Iberian peninsula, is Neopodocinum meridionalis (Moraza, 2004). Yet another phoretic mite, Nicrophorus vespilloides, was probably that photographed on a Common Sexton Beetle (Nicrophorus vespilloides) in a previous blog on decomposition. Finally, as an aside, it is interesting to notice some of the adaptations which this species has for burying in dung. 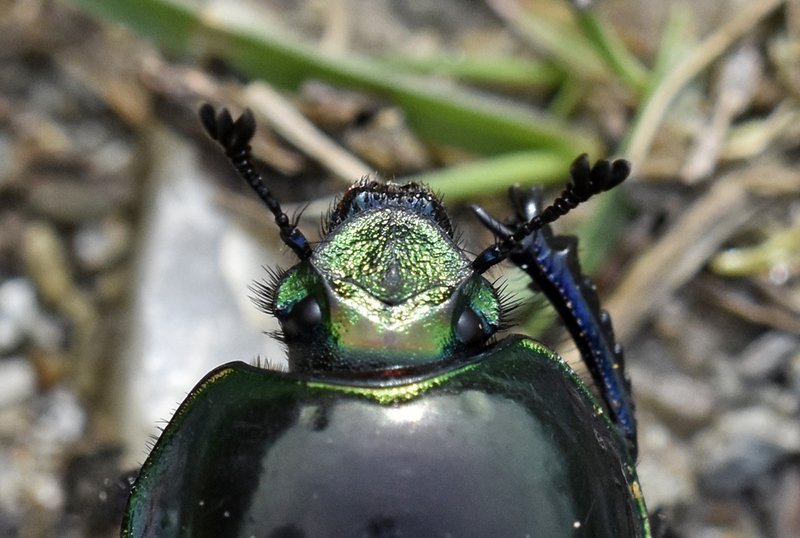 For example, there are distinct flaps on the head which appear to be positioned to protect the compound eye (see below). Similarly, when viewed from above, there are rows of bristles along these flaps, or flanges, which almost look like eye-lashes (see below). Again, these look like an adaptation to protect the eye. No harm came to any of these beetles (or mites!) other than being temporarily flipped over! Moraza, M. L. (2004). The phoretic genus Neopodocinum (Oudemans, 1902) in the Iberian Peninsula (Acari: Mesostigmata: Macrochelidae). Revista Ibérica de Acarología, 10, 261-269. Niogret, J., Lumaret, J. P., & Bertrand, M. (2006). Review of the phoretic association between coprophilous insects and macrochelid mites (Acari: Mesostigmata) in France. Elytron, 20, 99-121. Perotti, M. A., Braig, H. R., & Goff, M. L. (2009). Phoretic mites and carcasses: Acari transported by organisms associated with animal and human decomposition. In Current concepts in forensic entomology (pp. 69-91). Springer Netherlands.